blog.HalloweenAdventure.com | Latest News from the Costumes Trend FrontLines! : Harry Potter for Halloween! Halloween is coming, and we're suiting up in our favorite costumes of all - our Harry Potter gear! We have a wide variety of Potter outfits to suit all shapes and sizes. Real Harry Potter fans will use their costumes on any old day. They don’t discriminate! We’ll start with the boy who started it all: Harry Potter himself! Our Premium HP Gryffindor Costume is the perfect way to dress as Harry. It features a premium deluxe hooded robe is made of Black velvet and lined in Burgundy satin with a front clasp and the Gryffindor Crest on the front. We recommend practicing Quidditch in this robe, sure to keep you warm at all times! Wand sold separately here. For Ron and Hermione, try our Gryffindor Robes. 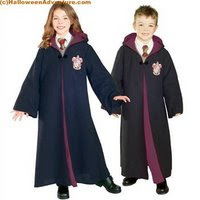 These robes match Harry’s, so they can even be used for a Neville or Seamus costume. They feature black ankle length robes with attached hoods, burgundy accents, front close clasps and an embroidered Gryffindor Crest patch on the front. Be sure to get them cleaned and pressed in Diagon Alley before you start up school at Hogwarts! Got blonde hair? Have a thing for Draco Malfoy? The baddest troublemaker at Hogwarts (after Harry himself, of course!) is Malfoy, and we’ve got a Slytherin Robe Costume to help you channel him. The mean attitude and the high-pitched voice you’ll have to master on your own. Costume includes robe, shirt and tie. If you’re looking to go the scary route, we have two options: Death Eaters and Dementors. Freaky and frightening, these numbers are as scary as they look. Our Harry Potter and the Half Blood Prince Deluxe Death Eaters costume features a grey and white mask that’s so realistic you could swear you’ve mutated into a real servant of Voldemort! The costume includes a hooded cape with attached shirtfront and mask. 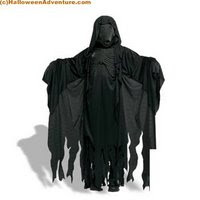 Another freaky and fabulous HP costume is our Harry Potter Dementor Costume! You may want to practice your scary hands so that when you invade the Hogwarts Express en route to school, or ruin a Quidditch game, you do so believably. Costume includes Black character mask and long black robe with chest piece.